It's time to decorate for the holidays, and these whimsical Skiing Snowman Christmas Stockings will make a fun addition to your holiday decor. You can make your own with my sewing kit and digital tutorial - 2 Sizes available - almost 2 feet long and almost 18 inches. The kids will love to see these filled with gifts from Santa Claus! Who can resist the cute skiing snowman! 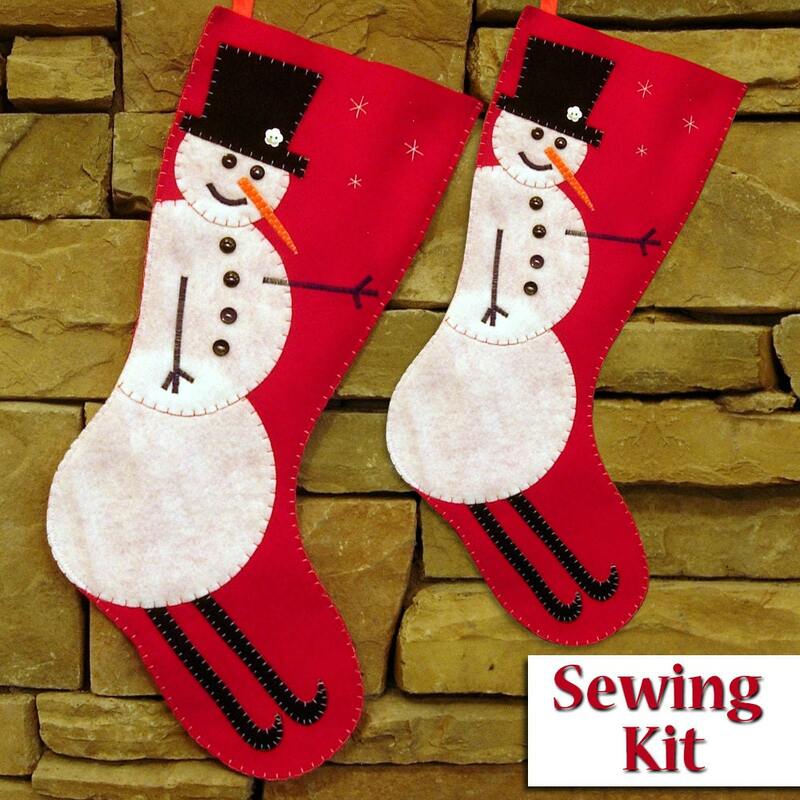 Your sewing kit will include all the fabric pieces already cut and notions you will need to make the Skiing Snowman Christmas Stocking (except the thread) as well as a printed manual. Choose from Blue or Red felt. Large or Small size. Designed for beginners with some experience and takes about 1 hour to make. Detailed manual includes easy step-by-step instructions with over 15 photos and diagrams. Manual is written in English with metric conversions. • Finished stocking is 11-1/2" w x 21-3/4" L (29.2cm x 55.2cm). • Opening is 8-3/8” across (21.3cm). • Finished stocking is 7-1/8" w x 17-1/4" L (18cm x 43.8cm). • Opening is 6-7/8” across (17.5cm). Due to the nature of this product, no returns will be accepted nor refunds will be given. Pattern pieces and manual are written in English with metric conversions. This pattern and manual have been created for personal, at-home use only. Products created using this PDF sewing pattern may not be sold, and factory/mass production is prohibited. Replication and/or distribution of any and all aspects of this PDF sewing pattern and manual are strictly prohibited.